How can something so simple make one so happy? 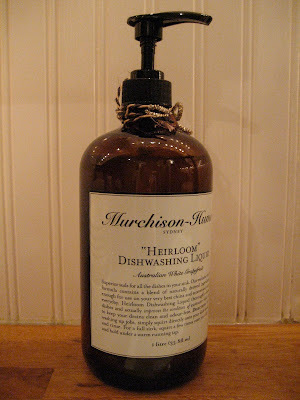 I picked up this deliciously scented dishwashing liquid at Anthropologie the other day. I fell in love with its large sized, amber hued glass bottle, and crisp clean label. I especially love the way it looks next to my sink. The best part is the highly recyclable packaging which allows me to re-fill and re-use the bottle! So long Mrs. Meyers...it was nice knowing you. I LOVE your counter, sink and that faucet!! The soap sound like a must try.. Thanks for the great tip! HAHAH! I love it. I have a million things around me at any time in a given day that make me happy and my husband can't understand it. Cute crossword notebook that I never write in? Check. Vintage earrings bought at a thrift store in a plastic baggy in my purse that I don't wear but keep just in case? Check. The way Lollia perfume looks by my mirror even though I don't wear it? check. i love your kitchen btw. the sink and the beadboard are on my kitchen wishlist! I know. Sometimes it is the simplest things that make the difference. It's so much fun to just buy a new pretty soap or candle. Confessed lover of delicious smelling soaps, (used to make my own for awhile) cleaning products,shampoos etc...especially ones with essential oils. I'm thrilled to get my favorites as gifts. My other indulgence is The Laundress detergents.